We have recently reported that Ram Charan Tej’s upcoming film, Dhruva, is progressing at a brisk pace and the second schedule has been wrapped up successfully. 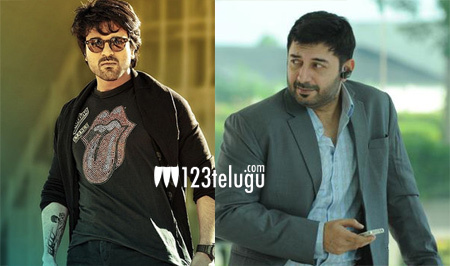 At a recent press meet, Ram Charan hailed Arvind Swamy saying that he is the heart and soul of the film. He added that Arvind will definitely be the biggest highlight of the film and that his expertise has helped the film come out better than the makers envisioned. Meanwhile, the film is slated to hit the screen later this year. Surendar Reddy is directing the flick.